My first taste of vintage 2017 – and a taste of summer in winter – though here in Auckland today it was shorts and t-shirt for a while as I walked along the beach without a skerrick of cloud or wind. And I didn’t have to chill the wine as it was left by the courier on the shady side of the house – a refrigerator in its own right. In the glass the hue is the colour of a pink fluorite gemstone though with a more lustrous sheen – sadly the photo does not do the pale pink colour justice – the incandescent lights don’t help either. The bouquet is so definitely pinot – that kind of savoury / fruity combo of red cherry and boiled lolly strawberry – then the taste just off dry and textural leaving behind mouth-filling flavours of wild strawberries with ripple of cherry and cream, a zing of refreshing acidity and then lovely anisey herb notes (think tarragon / chervil) come through to linger with natural but very gentle pinot savouriness. What a great alternative to a white wine at this time of year! Trying it with dinner later – will see how it goes. Watch this space. Update: Choko (coyote) baked in cream with fennel seeds – the choko and fennel seeds from my garden, the cream staring to caramelise because I was writing this blog – ntl an outstanding match. 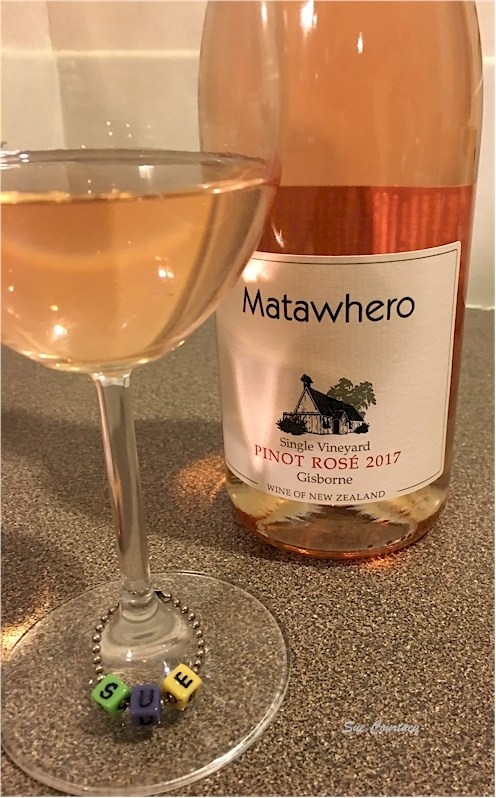 This entry was posted in #nzwine, gisborne, rose and tagged 2017, Matawhero by Sue Courtney. Bookmark the permalink.